M Billi, A Urquiza Gómez, C Feres Klenner (2017): “Environmental communication and non-conventional renewable energy projects. Content analysis of Chilean mass media”. Revista Latina de Comunicación Social, 72, pp. 1.218 to 1.237. Introduction. We observe how mass media thematise Non-Conventional Renewable Energy projects [NCRE] in terms of relevance and treatment assigned to distinct sources and emerging thematic structures. Methodology. Mixed-approach content analysis of a sample of 100 Chilean digital press articles relating to NCRE, using the analytical framework of Niklas Luhmann’s Social Systems Theory. Results and Discussion. The predominance of solar and wind sources goes hand in hand with a low terminological clarity, which however allows mass media to build distinct thematic structures around social systems such as economy, science, politics and law. Environmental references are less frequent and shallower, privileging its evocative aspects with maximum linkage capacity. Conclusions. Instead than observing mass media as mere transmitters of rationalities external to them, more attention should be given to their ability to create realities and representing the (human and ecological) environment. Mass media; environmental communication; non-conventional renewable energies; energy crisis; climate change mitigation; Chile. 1. Introduction. 2. Mass media communication and environmental themes. 3. Theoretical and methodological approach. 3.1. Theoretical approximation. 3.2 Methods. 4. Results. 4.1. Energy sources. 4.2. Energy and society. 4.3. Energy and environment. 5. Discussion. 6. Conclusions. 7. Notes. 8. Bibliographic references. Among all the environmental issues, climate change has undoubtedly been the most successful in getting access to areas as diverse as economics, politics, science, law or education, and in expanding from the enlightened circles of Europe to a growing number of regions, including Latin America. Most countries in the world are now engaged in international negotiations and agreements -the last of which was held in Paris last year- to assess the best ways to respond to this complex facet of the contemporary "environmental crisis" (Blanco, 2016; Estenssoro, 2010; O’Brien, 2012; Postigo, Wells and Cancino, 2013). In this context, it is important to highlight the increasing criticality that energy policies are acquiring as a key objective within global efforts towards more sustainable development paths (United Nations , 2015), also in consideration of the multiple challenges related to the security of supply, inequality in the access to energy and energy-related environmental impacts (AGECC, 2010; Birol, 2007; IPCC, 2012). In Chile, as in many other countries, energy is the sector with the highest contribution in terms of Greenhouse Gas emissions [GHG], the main causal factor of climate change (MAPS Chile, 2014). Combined to the urgency to reduce the country’s dependence on imported fossil fuels and the opportunity to achieve significant environmental and social co-benefits, this has made it a priority for the Chilean government to promote the transition towards a more sustainable energy matrix (Agostini, Nasirov & Silva, 2015; Estenssoro, 2010), and particularly to increase the share of Non-Conventional Renewable Energy [NCRE] in electricity generation . Said transition is one of the central axes of the new energy strategy inaugurated in Chile (Ministerio de Energía, 2015). However, also because of the growing conflicts that in recent years have hampered the execution of energy projects (Arrese & Wells, 2016; Astorga, 2013; Fuenzalida & Quiroz, 2012; Garrido, J., Rodríguez, I.; Vallejos, 2015), increasing attention has been directed to the public perceptions of different energy alternatives and their social relevance in terms of climate change mitigation: such perceptions, in fact, will have a relevant impact in terms of effectiveness, decidability and feasibility of the public policies directed to reduce GHG emissions through changes in the energy matrix (Hoyt, 2012; Nygrén, Lyytimäki & Tapio, 2012). Consequently, it is increasingly seen as a cause of concern that, despite the rising visibility and awareness of environmental issues in general and of climate change in particular, a large proportion of the public still retains attitudes such as denial, doubt, apathy or scepticism towards these phenomena, uncertainty about their effects and causes, or distrust regarding their possible solutions (Engels, Huether, Schaefer & Held, 2013; Zhou, 2015). Among the factors that have been associated with these attitudes are individual preferences and the presence of alternatives (Scheer & Renn, 2014), risk perception and understanding (Yang, Rickard, Harrison & Seo, 2014), the values and ideologies of each individual (Corner & Pidgeon, 2014), the distribution of impacts between local and global levels (Moyano, Paniagua & Lafuente, 2009), the lack of trust on institutions and the relative importance attributed to the environment with respect to other issues (Zhou, 2015) and even the political orientation, cultural origin, income levels and education (Engels, Huether, Schaefer & Held, 2013). In sum, the literature tends to talk in terms of a 'gap' between public understandings and scientific consensus regarding these themes, which is usually attributed to either the lack of information (information gap) or the coherence between scientific truths and publicly held beliefs and ideologies (belief gap) (Bliuc y otros, 2015; Hart & Nisbet, 2011; Nisbet, Cooper & Ellithorpe, 2014). In both cases, it was flagged as one of the central issues to investigate the role that environmental communications -namely, the mass media- play in building a public understanding of climate change and its solutions. Although a broad literature (discussed in the next section) tackles how media communications represent climate change, much less research has focused on how specific mitigation solutions and measures, particularly those related to energy projects, are represented by mass media (Barranquero & Marín, 2014; Smith & Lindenfeld, 2014). This is particularly true in Latin America, and especially in Chile, where most of the research related to environmental communications in the energy field focuses on specific projects and on the protest movements that have been emerging around them (Fuenzalida & Quiroz, 2012; Rodríguez, Peña & Sáez, 2014)or rather, on the role performed by mass media in informing public opinion on climate change (Dotson, Jacobson, Kaid & Carlton, 2012; Hasbún, 2014) although not offering a full understanding of how such media represent energy projects and their impacts. The present paper seeks to fill this gap, investigating how Chilean mass media thematise Non-Conventional Renewable Energy projects, giving special attention to the relative weight assigned to different NCRE sources in the Chilean media agenda; and to the thematic structures that emerge within mass media communication. The paper is organized as follows: Section 2 reviews the existing literature and identifies some issues which it proposes to fill by means of the theoretical and methodological approach presented in section 3. Subsequently, the main results (4) are presented, and then discussed with respect to the role played by mass media in relation to environmental issues (5). Finally, some conclusions will be offered with regards to the main findings and limits of the present study (6). In spite of the role that mass media may have played in the first socializations of the ideas of environmental crisis and climate change (Anderegg & Goldsmith, 2014; Barranquero & Marín, 2014), many doubts have been raised regarding the impact these communications are having today in terms of building a critical conscience and generating a consensus around these problems and their solutions, something which is particularly important considering the social and behavioural changes that these imply (Diaz, 2009; Villodres, Castro & García-Leiva, 2014). According to an understanding widely spread in the literature, the media would have the ability to influence public perceptions and attitudes, either by inducing priorities in the public agenda -and indirectly, the political one- (agenda-setting), or by describing and signifying these issues within certain frames (framing), that is, by giving more weight to certain aspects of reality, promoting a certain causal interpretation, moral evaluation or recommendation of treatment, or holding a specific argument or position (Cherry, Hopfe, MacGillivray & Pidgeon, 2015; Hasbún, 2014; Dotson, Jacobson, Kaid & Carlton, 2012). On this basis, several shortcomings have been highlighted in mass media’s treatment of environmental and climatic changes, either in terms of their coverage (Anderegg & Goldsmith, 2014), of the topics which receive the most attention (Nygrén, Lyytimäki & Tapio, 2012), of the weight given to relatively minor scientific hypotheses (Castilla, Quesada & Teruel Rodríguez, 2013), of their precision (Lee, Hong, Kim, Hong & Lee, 2013), of the relative importance acknowledged to mitigation or adaptation policies and to different sources of information (Takahashi, 2013), or of the form in which such communications are framed in terms of the existence and anthropogenic character of the phenomenon (Hasbún, 2014). Others have highlighted the differential narrative structures and topics along different media (Hart, Nisbet, 2012), or related these to the ownership structures of each specific mediatic organization (Lee, Hong, Kim, Hong & Lee, 2013; Takahashi, 2013). These approaches, however, also tend to attribute a hierarchical superiority to scientific consensus over the descriptions proposed by the mass media, therefore observing the latter in terms of their -more or less distorted- ability to represent scientific ideas, and thus criticizing the 'excessive' attention mass media give to events and contrasts of a political nature or to minority-held scientific theories and debates (Blanco, Quesada & Teruel, 2013; Nygrén, Lyytimäki & Tapio, 2012). Conceptualizing public opinion through notions such as public scepticism (Zhou, 2015) or understanding/information gaps (Nisbet, Cooper & Ellithorpe, 2014) seems to presuppose the objectivity of scientific understanding, something which has become quite difficult to maintain within the current crisis of positivist epistemologies (Guba & Lincoln, 1994); moreover, this suggests a one-dimensional understanding of public opinion, which does not value its internal differences, and implies an erroneous opposition between scientific rationality, on the one hand, and public ignorance or irrationality, on the other (Kurath & Gisler, 2009). In addition, these studies tend to assume a normative horizon by focusing on improving communication strategies or promoting a kind of communication oriented towards development or sustainability (Barranquero & Marín, 2014; Díaz, 2009; Hoyt, 2012). This leads such approaches to understand the role of mass media in terms of literacy and reduction of uncertainty, thus flagging as dysfunctional their indulgence in entertainment and sensationalisation, among other activities (Castilla, Quesada & Teruel, 2013; Díaz, 2009) . By doing so, they render invisible the role media could play in informing about divergent positions and promoting participation in the construction of alternative realities, debates and diversity of opinions: fundamental ingredients within the self-description of the modern society as democratic and pluralist (Fitoussi & Rosanvallon, 2010) . These problems motivate our proposal to study mediatic communications in its own right, that is, we will try to avoid reducing their value to how well they reflect scientific information, nor to the role they play in educational or political terms. As will be argued in the following section, this led us to decide using Niklas Luhmann's Social Systems Theory as our theoretical framework. According to Luhmann (2007), society should be conceptualized as a constitutive system of meaning, composed by communicative operations which reproduce and determine themselves autonomously with respect to their environment (autopoiesis). In particular, modernization accounts to a progressive process of differentiation of such communicative operations into partial systems in charge of a specific communicative function, themselves autonomous from each other: therefore, contemporary society lacks a hierarchy or a principle of absolute reality with respect to which to evaluate the validity of the themes that appear in mass communications. The mass media are one of such partial systems, charged with the function to allow and direct the self-description of society, and to provide irritations for the other functional systems --policy, economics, science, law, art, etc.--. Mediatic communications, therefore, should be seen as autonomous constructions of reality, which, while appropriating distinctions and problems of scientific communication, politics and public opinion, effectively determine what is communicated and how it is communicated -in the form of themes- on the basis of their own processes, proposing new meanings for their audience (Becerra & Arreyes, 2013; Görke & Scholl, 2006; Luhmann, 2007b). At the same time, these communications can have a high relevance for other systems: on the one hand, these can be affected by the treatment they receive in the mass media; on the other, they may require for the mass media to spread their communications and expand their reception: this is, for example, the case of the scientific communications on climate change. Mass media, moreover, play a fundamental role with regards to the political system, which is tightly coupled to them through public opinion, itself understood as a 'space' without geographical boundaries, which enables non-dialogical communication between an indefinite number of participants, and is capable of conditioning the forms of exercising the power and functioning of democracy (Cordero & Marín, 2006), of defining power relationships (Castells, 2010) and allowing to the very politics to observe and correct (Luhmann, 2009). Such ‘public’ should not be seen, therefore, as the sum of individual perceptions, but as a constellation of meaning (Görke & Scholl, 2006), captured in a relationship of co-dependency with the very mass media, which need the public agenda they contribute to construct. From the fore mentioned consideration descends the importance of observing how this media-public unit builds meaning and simplifies the complexity of the world through its own mechanisms and structures. One interesting consequence of this approach is that it opens up the possibility to problematize the forms with which environmental problems, particularly those related to climate change, are communicated within society, without having to introduce or privilege a single condition of rationality or an absolute causal scheme; rather, it invites to appreciate the very complexity that characterizes the observation and communication of any social phenomenon, and the benefits in terms of self-description and self-alarm that such media grant to society (Luhmann, 2007; Willke, 1993). To these ends, we performed a mixed-approach (Flick, 2004) content analysis (Krippendorff, 1989) on Chilean digital press pieces concerning NCRE. Our unit of analysis were news and columns of opinion --excluding articles without text, such as galleries of images and videos--, published in the digital editions of the newspapers La Tercera and La Nación, in the period between 2011 and 2014: 2011 saw a strong increase on the presence of energy issues in the media in concomitance with the explosion of socio-environmental conflicts related to the mega-dam project labelled Hidroaysén (Astorga, 2013). Digital newspapers are the fourth most used kind of mass media in Chile (Hasbún, 2014); the newspapers we selected are two of the most important one within the Chilean digital press, and display different trajectories both in terms of their political profile and of their level and type of audience. This notwithstanding, a preliminary analysis did not show any substantial differences in the way each of them approaches NCREs , which justified a joint analysis of the news included in both pubblications. Content analysis requires coding and interpreting the empirical material based on a system of categories, which can be constructed either in a deductive way --deriving it directly from the chosen theoretical-conceptual framework-- or an inductive-empirical one --generating it from the data (D'ancona, 1996)--. Using a mixed design implies adopting tools of both a quantitative and a qualitative type, complementing the systematicity, replicability and representativeness of the former with the depth and contingency of the latter (Driscoll, Appiah-Yeboah, Salib & and Rupert, 2007). Consistent with this, two separate samples were taken: the analysis sample consisted of 100 news pieces selected by means of intentional clustered sampling (Asún, 2006): each newspaper was treated as a separate sampling unit with a sample size of 50 articles, selected from a universe of 340 articles whose title, subtitle and subject dealt with one or more NCRE sources (solar, wind, biomass, geothermal or tidal power) in the period considered. Additionally, within those texts that were not included in the analysis sample, 10 news pieces were extracted using intentional sampling and saturation criteria (Martínez-Salgado, 2012). These served for the qualitative pre-analysis phase, aimed at generating, through a process of open codification and constant comparison of incidents, the central categories capable of accounting for the forms of observation used in the texts, particularly with respect to: the main themes treated, their relations, and the distinctions and evaluations associated with energy projects and related issues (Abela, 2002). The definitive system of categories resulted from the combination of the results of the pre-analysis with the theoretical-conceptual antecedents, and considered five typologies of variables, each one operationalized through a variety of specific codes that were applied to the corresponding registry unit -intended as the minimum portion of isolated content and subjected to analysis- (Tab. 1 ). law, mainly in the light of conflicts and debates about the territorial impacts of projects and the need for energy regulation. 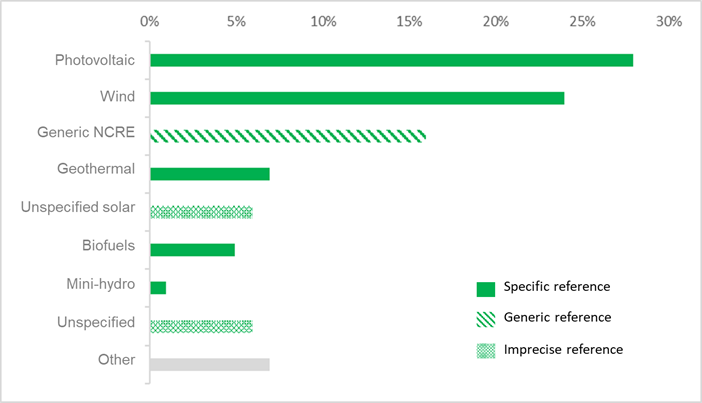 Once the system of categories was determined, it could be used to codify and analyse the material, with the support of computer tools (Atlas Ti, SPSS and Microsoft Excel), which allowed to both quantitatively and qualitatively describe the occurrence, content, treatment and relative importance of different codes, as well as the associations between them. This section will briefly present and discuss the main results of the analysis, organized in three sub-sections: 4.1 will examine the media treatment of different energy sources; 4.2 will pay attention to how the media describe the energy projects and the social processes associated with them, while 4.3 will address the way in which the environment is thematised. In section 5., these results will be integrated into a general discussion on the role of mass media. A first result refers to the marked confusion with which the media denominate energy sources: references to generic terms like 'ERNC' or 'renewable', 'conventional' or imprecise indications like 'solar' (without differentiating between the production of photovoltaic electricity, and thermal soral systems generating hot water), ‘hydroelectric’ (without distinguishing between large reservoirs and run-of-river power plants), ‘bioenergy’ (including both ‘clean’ fuels derived from recycling organic waste, and wood pellets used for domestic heating), etc. This confusion could be associated with a low degree of evolution in this kind of semantics, which seem not to have reached yet a level of condensation which would allow for the determination of the type of energy to be both precise and concise at the same time; facing this trade-off, media communication, concerned with achieving high levels of connectivity, seems to be oriented toward a generic and strongly evocative use of terms, rather than technical precision. Also interesting is the strong prevalence of news items that contain references to photovoltaic and wind power sources (Fig. 1 ). This could be related to the fact that these are the most consolidated sources in Chile among the NCREs, both because they are the oldest and the ones with the highest stalled or projected capacity (CIFES, 2015). However, it strikes us as interesting how the media often seem to talk about these two technologies to refer to the full ERNC portfolio. Conversely, no news piece displays tidal power as its main object --i.e. mentioning it directly in its title or giving it a leading role in the text-- and only one did so with mini-hydroelectric In addition, both these technologies are never treated in isolation, but only appear in conjunction with other types of NCRE, as an example among others. This seems to point to an idea of ERNC as a 'bundle' of alternative solutions to conventional energies: of the 97 news items that deal with some ERNC source, 69% present it together with one or more of the other sources of this typology. 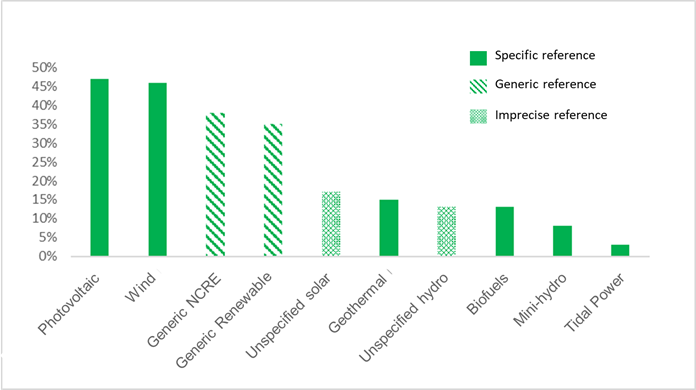 In addition, even when only one type of NCRE appears in the articles, in 53% of cases this is compared to some type of conventional source, mainly fossil or, to a lesser extent, thermal solar systems. In more qualitative terms, photovoltaic solar energy seems to be the most valued by the media, followed by geothermal; thermal solar systems are also appreciated, as well as biofuels, while the wind receives a greater number of ambivalent treatments due to its environmental and territorial impacts. In general, these results show a strong correlation with the perceptions manifested by the Chilean public opinion in terms of energy matrix (Feedback & Deuman, 2015): this could suggest a possible influence of the media agenda in translating these assessments, consistent with the 'agenda setting' and 'framing' theories supported by the international literature; but it could also be interpreted as an adaptation of said mass media to what is publicly desirable. These positive assessments are often based on an association of NCRE with an idea of ​​GHG emission reduction -although the word "mitigation" never appears in the articles, perhaps because it is considered too technical- and with the notion of ​​clean, non-polluting energy, with low impact on the environment and with ideas of innovation and improvements to the energy matrix. In addition, the news often underlines the untapped development potential that these technologies would have in Chile due to the country's territorial and climatic characteristics. Finally, it should be noted that, although no keywords related to conventional energies were included in the search, such energy sources are in fact mentioned in more than 40% of the news pieces, although they never play a leading role in them. In many cases, these references are used as terms of comparison against which to evaluate the potential or performance of the NCREs: this is consistent with the reality of the country, in which conventional energies, particularly hydroelectricity and fossils, represent the status quo, opposed to which the NCREs present themselves as an alternative. Consistently, when mentioned, conventional energies are associated with environmental impacts, with the ​​dependence on imported fossil fuels -and the risks in terms of security of supply that became apparent from the repeated energy crisis of the last decade (Nasirov & Silva, 2014)-, and with conflicts and criticism by public opinion. Fossil energies are often summoned show the comparative advantages, in terms of environmental impact, cost, innovation, and energy independence, of options such as solar photovoltaic and wind power. However, in some cases the importance of having traditional power plants to balance the fluctuations --daily and seasonal-- in energy production typical of many NCREs is also underlined. Hydroelectricity has a more ambivalent treatment: sometimes it is positioned to the par with the fossil energies, and therefore flagged as ‘conventional’ -with the corresponding pejorative evaluations; other times it receives a much more favourable treatment, being assimilated to the NCREs as a sustainable development option for Chile. Mass media agenda does not give the same space to all social systems; rather, it seems to privilege economic and scientific understandings of energy over political or juridical ones. In this context, the media do not have a single way of thematising NCREs, but adopt a different understanding of energy, its relevance and its problems according to the rationality that guides the functional system to which each communication is referring. Thus, when they take an economic stance, the central concern of the media is the realization of energy projects that allow to balance the increase of demand in the country, particularly by the mining sector. Around this, other issues appear that boost or halt the realization of such projects, for example: financing, market factors, suitability of projects and solidity of companies. On the other hand, in reporting scientific findings, the media mainly emphasize the relevance of research and innovation to promote the adoption of alternative technologies, which allow to solve the problems and limits of conventional sources (cost, impacts, dependence on other fuels); sometimes, evidence is also given to the use that companies and communities make of the scientific evidence within the controversies and conflicts in which they are confronted. Political thematization focuses on the planning function through which the political system attempts to lead the realization of these projects towards a greater diversification of the energy matrix. This in turn connects with three ideas: clean energy, safety and convenience. Said planning, however, is described as ineffective, leading to criticism by the media, communities and the very power generators, as well as to national and international pressures to ensure strategic certainty and compliance with long-term goals and commitments. Finally, law is mentioned less frequently, but it is given a significant weight in all other areas mentioned above, particularly through regulation of the sector, and environmental approval of energy projects, an issue of great relevance both for private companies and for the Government, local communities and NGOs. It is also interesting to note that the references to different social systems are characterized by different narrative styles. In general, registers of cognitive or descriptive type prevail within news pieces adopting a scientific or economic thematization, while more normative assertions, such as aspirations, obligations and needs, occupy a much smaller space there; these are reserved especially for references to political and legal issues, and particularly for news about political processes, participation and inclusion, planning and regulation, citizenship and public opinion, environmental approval, crisis, criticism, conflicts, etc.. Therefore, it appears that the stylistic registers used by the media in referring to different functional systems harmonize with the operational style of each system: more cognitively-oriented in the case of science and economy, and more normative in law and politics (Mascareño, 2011). One last mention deserves the concept of 'crisis': although in Tab. 2 it was classified within the political thematization, in the media construction it is possible to glimpse its displacement throughout all the analysed systems: as an imbalance in the market equilibrium for the economy --insufficient supply in relation to the demand--; as increased demands for participation and transparency in environmental approval processes within the juridical system; as a crisis of feasibility for science, in the face of increased pressures for the development of technical solutions to respond to the growing energy and environmental demands; or as a crisis in policy planning, asked to mediate between the flexibility of economic needs and the rigidity of long-term goals, between feasibility and opportunity, between existing and necessary standards, between the demands of participation of communities and decision-making of organizations, etc. Among the topics presented in the previous section, it is possible to distinguish seven that refer -in different ways- to the environment: globally, these represent a minority of the total of the media communication about NCRE (less than 15%), most of which is directed to different social operations within diverse functional systems. Except for environmental approval processes, which are strictly legal, all these themes are derived from the semantics of science, or from spaces of coupling between this and other functional systems, as is the case with ideas of clean energy and sustainability --that entered political semantics-- and environmental impacts --acquired by law--.. In addition, these themes, although quite recurrent in the sample, tend to take peripheral roles in the news, reinforcing what is being argued in them, but without acquiring a central valence on their own; on the contrary, they play a secondary, idealistic, and instrumental role with respect to the different descriptions and arguments that are being dealt with in each article, more specifically related to societal thematic structures -be they political, scientific, economic or even legal. Thus, for example, it can be affirmed: "Chile is a mining country and as such has multiple challenges. One of them is the generation of clean and sustainable energies. " (La Tercera, March 15th, 2013). Here, 'clean energy' and 'sustainability' are used as ideals, normative criteria that would be desirable to achieve: their treatment is thus largely favourable, and in many cases based on hopes or probabilities rather than concrete facts, in addition to being implicitly contingent on the mining challenge. Also, unlike what happens in the case of themes related to social systems, environmental issues are incapable of forming a true environmental thematic structure, resulting relatively isolated from each other: two exceptions are the climate change-reduction of emissions dyad, and to a lesser extent the clean energy-sustainability one. This does not mean, however, that environmental issues are mere decorations; rather, they appear as a distinctive attribute of NCRE projects and their evaluation, but remain subject to the constitutive logic of energy initiatives, to the economic and political rationality that moves them, and to the scientific and legal processes that make them possible: for example, GHG ‘emission reductions' are presented as a constant, reliable, predictable and quantifiable impact of NCRE projects but are given a secondary, positive but not central role in the evaluation of energy projects, in which, on the contrary, criteria such as costs, convenience, public opinion, etc. tend to prevail. Interestingly, this is the opposite of what happens in the scientific communications connected with climate change, which usually emphasize this as a central objective to which public policies should aim, labelling socio-economic, political, equity, and other consequences as mere co-impacts (MAPS Chile, 2014; IPCC, 2007). These results can be compared with the assumptions implicit in the most common approaches in terms of environmental communication in mass media (see Section 2). If we accept Görke’s (2001) proposal, mass media would have the function of interrupting the operations of the different functional systems and thereby building a ‘public’ capable of synchronizing the contrasting perceptions of these systems. As it was observed in section 4, the media communication about NCRE tends to reproduce the operation of the systems from which it takes its references, as well as the tension between the normative expectations of law and politics, and the cognitive ones of economy and science. Environmental references, which do not have a specific communication system to mimic, rely on both structures, dealing more cognitively with references connected to economic and scientific processes -in terms of the potential for emission reductions of energy projects or the characteristics and resources of the territories- and adopting a more normative tone in relation to political structures, such as when invoking sustainability and clean energy. This is particularly evident in the idea of ​​territory, which in the mediatic description appears as a scientific object (as far as it can be studied), but also an economic (as a source of resources), political (as a place of demands and inequalities) or legal one (as a key factor for environmental approval). This expands the range of descriptions and evaluations available to the public, and creates novel connections from which an (unstructured) ecological communication emerges and is visible throughout the different systems on which it is based; with the downside, however, of losing in depth, being limited to evocative and vague references to processes that, within each system -and within science in particular- would be quite denser. In this sense, mass media do show a tendency to the simplification of the world by means of its numbering and of the condensation of different themes --energy development, climate change, air pollution-- in semantics which attempt to evoke images as close as possible to the audience, even when this means sacrificing depth and precision. Precisely by doing this, the media manage to transform into something simple and close that which would otherwise be complex and distant, such as climate change. If on the one hand, this flattens all its dimensions and dynamics in a single static picture, it achieves the feat of making it visible and understandable to readers who would not be able to access it in its original technical form: this is the function that mass media fulfil in society, generating meaningful information for their audience (Görke & Scholl, 2006; Luhmann, 2007b). In spite of the literature examined in section 2 (Blanco, Quesada & Teruel, 2013; Díaz, 2009), we claim that this should not be considered a distortion; rather, it results of the very connective and informative function of mass media (2001; Görke & Scholl, 2006). As already discussed in Section 3, the ‘public scepticism’ about climate change (Zhou, 2015), rather than showing an ‘architectural weakness’ (Díaz, 2009, pág. 7) of mass media communications, should be interpreted as another, distinct, autonomous, and non-comparable, construction of reality (Görke & Scholl, 2006; Luhmann, 2007b), while still retaining relevance for politics or science, due to the impact it may have on the feasibility of energy projects. Rather than criticizing the media for their inability to build consensus, a less normative observer is astonished at the variety and multiplicity of realities, issues, and assessments that, as was shown in the previous sections, the media have been able to construct around energy projects. And it is even more surprising to discover how, in the mediatic reality, systems that function separately, autonomously, unintelligibly, become capable of communicating and interacting with each other, becoming characters of the same story, parts of a whole: politics dialoguing with science, the economy and law; the economy calling to science for evidence, and financing innovation; science itself studying subjects of economic convenience, and law regulating and limiting all other systems. Conflict, debate and criticism allow for the innovation and variation without which no social evolution would be possible (Luhmann, 2007). In questioning the media for giving more space to the presentation of divergent and minority positions than to the falsification of hypotheses (Díaz, 2009) one would be undermining precisely the possibility to negate reality as it is and thus, the evolutionary possibilities of the mass media system, and of the public that is constructed within it. In addition, this does not recognize the key role that the same debates and diversity of opinions play in the democratic and pluralist self-description of modern society (Fitoussi & Rosanvallon, 2010). Despite the ability mass media seem to hold to synchronize the perceptions of the public on environmental themes, we should note that, if the references to environmental issues remain as fragmented and shallow as they currently are, public perceptions also will come out similarly fragmented and void of content. Therefore, the relatively small weight of references to environmental themes should draw our attention, even more so since it confirms what the literature has observed regarding other potential public policy objects: for example, observing the media debate about the tax reform on vehicle emissions in Finland, Nygrén, Lyytimäki & Tapio (2012) note that societal factors dominates the media discussion about such reform, leaving little room for a deep public understanding of the environmental conditions necessary for sustainable transport. Similarly, in view of the relative centrality of the crisis category within the media descriptions of social processes related to energy, it is astonishing not to find any reference to an environmental dimension of the energy crisis, which on the contrary, only seems to articulate itself along the rationalities of the different social systems and their interactions --i.e. structural couplings (Luhmann, 2007)--. Another sign, perhaps, of the secondary role that environmental impacts play within energy thematization: a mere co-impact of processes that seem to be governed by completely different logics. This paper has sought to give an account on how the Chilean mass media thematise NCRE projects. Based on a content analysis of digital news press, we observed how different energy sources are treated and made visible by such media: we noted a remarkable primacy of solar and wind sources, which seem to act as representatives of a 'bundle' of alternative solutions to improve the Chilean energy matrix; we discussed how NCREs are often seen as examples of innovation, clean energy, and as an untapped development potential for the country. We also highlighted the general lack of clarity with which the media distinguish the different typologies of sources, preferring the evocative capacity of the term to its technical specificity. This lack of terminological clarity, on the other hand, was not only apparent with respect to the sources, but was common to most of the subjects treated in the news pieces. This, however, did not prevent the emergence of quite clear, and distinguishable thematic structures, particularly in relation to established social systems, such as economics, science, politics, and, to a lesser extent, law. Conversely, mass media agenda seems to provide much less visibility to environmental references, which are often treated with little depth, prioritizing to their evocative aspects and maximizing connective capacity. However, instead of interpreting this as a mediatic distortion, we took this as proof of mass media’s capacity to construct an alternative reality of its own, no less real for the reader than the one proposed by science -although not as rigorous nor founded on evidence-. This 'mediatic reality' has proved capable of building bridges between the different rationalities of each social system, forming a general semantic map from which the public may look to and evaluate projects and energy sources, thus allowing for the emergence of a transversal and integrated, if superficial and fragmented, understanding of the relationship between society and its environment. In a functionally differentiated society, lacking a global rationality from which to look at the societal environment, this is by no means obvious, but rather a highly improbable achievement. It would be very interesting to question how this became possible and how mass media contribute to creating the conditions for the installation of a communication of this type. In addition, we may wonder whether this is a specificity of environmental communication --linked with its peculiar other-referential character-- or a constant feature of media communication. Similarly, we may question why, despite this, the mediatic thematization of the energy crisis lacked an explicit environmental dimension, limiting itself to economic, scientific, political and legal manifestations. And finally, we may ask what is the role that the media play in disseminating and reproducing these very crises. In summary, the present research has allowed us to show the limits of certain positions, widely disseminated in the literature, which, even with the merit of critically observing the environmental reality that is constructed in the media, seemed self-limiting in postulating the possibility of these means of adhering only to a political or scientific rationality, and to endow the latter with a higher standard of reality, reducing mass media to a mere representation of such reality. On the contrary, we claimed the importance of investigating how a mediatically constructed reality incorporates environmental concepts and why it does, i.e. according to which structures of the same mass media --and their audience-- these concepts evolve and stabilize within mediatic communication. This work, however, is necessarily a limited effort, conditioned by the scope and contingency of the decisions taken in the sampling and analysis: in the future, it would be interesting to complement it by expanding the analysis to other newspapers and even to television formats, social networks etc. ; exploring other key energy-related keywords and alternative coding schemes; and observing the role that organizations --specifically editorial committees-- play on how mass media communicate about energy projects. Research funded.- This article is a product of the project of investigation related to the obtaining of the Magister in Systemic Analysis applied to the Company of the first author (Marco Billi), investigation financed by the Centro de Ciencia del Clima y la Resiliencia - (CR)2, Universidad de Chile (FONDAP 15110009) and by the Núcleo Milenio Modelos de Crisis, Universidad Adolfo Ibáñez (Centro de Ciencia del Clima y la Resiliencia - (CR) (Iniciativa Científica Milenio, Proyecto NS130017). Within the present manuscript, according to current Chilean regulations, the following technologies were identified as NCRE: biofuels; mini-hydro; geothermal; photovoltaic; wind power; tidal power (Ley Chile, 2008). The most significant differences referred to the type of geographic coverage of the two newspapers (more linked to national, local and scientific actors in the case of La Nación, and to economic and international organizations in La Tercera) and the style adopted by the news pieces (more neutral, more descriptive and less evaluative in La Tercera and more normative and evaluative in La Nación). None of these differences, however, significantly affect the findings presented here. Anderegg, W. R. & Goldsmith, G. R. (2014). Public interest in climate change over the past decade and the effects of the ‘climategate’media event. Environmental Research Letters, 9(5), 054005. Arrese, M. H. & Wells, G. B. (2016). Territorio y energías renovables no convencionales: Aprendizajes para la construcción de política pública a partir del caso de Rukatayo Alto, región de los ríos, Chile. Gestión y política pública, 25(1), 165–202. Astorga, E. (2013). Conflicto Ambiental en Patagonia. Observaciones sobre la comunicación medioambiental en la región de Aysén a raíz del proyecto Hidroaysen (Master Thesis). Universidad de Chile. Asún, R. (2006). Construcción de cuestionarios y escalas: el proceso de producción de información cuantitativa. En M. Canales Ceron, Metodologías de Investigación Social. Introducción a los oficios (pp. 63-114). Santiago de Chile: LOM Ediciones. Barranquero, A. & Marín, B. (2014). La investigación en comunicación y periodismo ambiental en España. Estado de la cuestión y revisión bibliométrica de las principales revistas académicas en comunicación (2005-2013). Prisma Social - Revista de Ciencias Sociales (12), 474-505. Becerra, G. & Arreyes, V. (2013). Los medios de comunicación de masas y las noticias como objeto de estudio de la sociología en la perspectiva del constructivismo operativo de Niklas Luhmann. Revista Mad (28), 47-60. Birol, F. (2007). Energy Economics: A Place for Energy Poverty in the Agenda? The Energy Journal, 28(3), 1–6. Blanco, G. (2016). Abriendo la caja negra del Cambio Climático: Claves para comprender su trayectoria política en América Latina. In A. Lampis (Ed. ), Cambio Ambiental Global, Estado y Valor Público: La Cuestión Socio-Ecológica en América Latina, entre Justicia Ambiental y ‘Legítima’ Depredación (pp. 45-66). Bogotá, Colombia: CES – Centro de Estudios Sociales / Ed. Universidad Nacional de Colombia. Blanco, E., Quesada, M. & Teruel, L. (2013). Entre Kioto y Durban. Posición editorial de los medios de referencia ante el cambio climático. Revista Latina de Comunicación Social (68), 420-435. Bliuc, A. M., McGarty, C., Thomas, E. F., Lala, G., Berndsen, M. & Misajon, R. (2015). Public division about climate change rooted in conflicting socio-political identities. Nature Climate Change, 5(3), 226-229. Castells, M. (2010). Comunicación y Poder. Madrid: Alianza Editorial. Chakravarty, S. & Tavoni, M. (2013). Energy poverty alleviation and climate change mitigation: is there a trade off? Energy Economics (40), S67–S73. Cherry, C., Hopfe, C., MacGillivray, B. & Pidgeon, N. (2015). Media discourses of low carbon housing: The marginalisation of social and behavioural dimensions within the British broadsheet press. Public Understanding of Science, 24(3), 302-310. CIFES. (2015). Reporte ERNC Febrero 2015. ComitéCorfo [online] Recovered on 21 November 2015 from http://www.cifes.gob.cl/reporte/2015/REPORTE_Febrero2015%20V3.pdf. Cordero, R., & Marín, C. (2006). Los Medios Masivos y las Transformaciones de la Esfera Pública en Chile. Documentos de trabajo ICSO-UDP N° 7. Corner, A. & Pidgeon, N. (2014). Geoengineering, climate change scepticism and the ‘moral hazard’ argument: an experimental study of UK public perceptions. Philosophical Transactions of the Royal Society of London A: Mathematical, Physical and Engineering Sciences, 372(2031), 20140063. D'ancona, M. Á. (1996). Metodología cuantitativa: estrategias y técnicas de investigación social. Madrid: Síntesis. Dotson, D., Jacobson, S., Kaid, L., & Carlton, J. (2012). Media coverage of climate change in Chile: A content analysis of conservative and liberal newspapers. Environmental Communication: A Journal of Nature and Culture, 6(1), 64-81. Driscoll, D., Appiah-Yeboah, A., Salib, P., & and Rupert, D. (2007). Merging Qualitative and Quantitative Data in Mixed Methods Research: How to and Why Not. Ecological and Environmental Anthropology (University of Georgia), Paper 18. Engels, A., Huether, O., Schaefer, M., & Held, H. (2013). Public climate-change skepticism, energy preferences and political participation. Global Environmental Change, 23(5), 1018-1027. Estenssoro, F. J. (2010). Crisis ambiental y cambio climático en la política global: un tema crecientemente complejo para América Latina. Universum, 25(2), 57–77. Feedback & Deuman. (2015). Energía 2050. Encuestas deliberativas. Ministerio de Energía. Fitoussi, J.-P., & Rosanvallon, P. (2010). La nueva era de las desigualdades. Buenos Aires, Argentina: Ediciones Manantial. Flick, U. (2004). Introducción a la investigación cualitativa. Madrid: Ediciones Morata y Fundación Paideia Galiza. Fuenzalida, M., & Quiroz, R. (2012). La dimensión espacial de los conflictos ambientales en Chile. Polis (Santiago), 11(31), 157-168. Garrido, J., Rodríguez, I.; Vallejos, A. (2015). Las respuestas sociales a la instalación de parques eólicos: el caso del conflicto Mar Brava en la Isla Grande de Chiloé (Chile). Revista de Sociologia. Riesgos Ambientales, Sostenibilidad y Políticas de Implicación Ciudadana, 100, 547–575. Görke, A. (2001). Entertainment as Public Communication: a systems-theoretic approach. Poetics, 29 (4/5), 209-224. Guba, E., & Lincoln, Y. (1994). Competing Paradigms in Quantitative Research. In E. Denzin, & Y. Lincoln, Handbook of Qualitative Research (pp. 105-117). California: Sage Publications. Hart, P. S., & Nisbet, E. C. (2011). Boomerang effects in science communication: How motivated reasoning and identity cues amplify opinion polarization about climate mitigation policies. Communication Research, 39(6), 701-723. Hasbún, J. (2014). Análisis del discurso de medios de comunicación digitales en Chile respecto al cambio climático: encuadres para la construcción de las agendas pública y política (Master Thesis). Santiago de Chile: Universidad de Chile. Hoyt, K. (2012). Changing the climate while reproducing power? Examining the social construction of "renewable" frames in mass print news media, 2000-2010 (PhD Thesis). University of Colorado. IPCC. (2007). IPCC - Intergovernmental Panel on Climate Change 2007: climate change 2007: synthesis report. Contribution of working groups I. II and III to the Fourth Assessment Report of the Intergovernmental Panel on Climate Change. Geneva: IPCC - Intergovernmental Panel on Climate Change. IPCC. (2012). Renewable Energy Sources and Climate Change Mitigation. Special Report of the Intergovernmental Panel on Climate Change. Krippendorff, K. (1989). Content analysis. In E. E. Barnouw, G. Gerbner, W. Schramm, T. L. Worth, & L. (eds.). Gross, International encyclopedia of communication (Vol. 1) (pp. 403-407). New York: Oxford University Press. Kurath, M., & Gisler, P. (2009). Informing, involving or engaging? Science communication, in the ages of atom-, bio- and nanotechnology. Public Understanding of Science, 18 (5), 559-573. Lee, J., Hong, Y. P., Kim, H., Hong, Y., & Lee, W. (2013). Trends in Reports on Climate Change in 2009-2011 in the Korean Press Based on Daily Newspapers' Ownership Structure. Journal of Preventive Medicine and Public Health, 46(2), 105. Luhmann, N. (2007b). La realidad de los medios de masas (Vol. 40). México, D.F. : Universidad Iberoamericana. Luhmann, N. (2009). La política como sistema. D.F., México: Universidad Iberoamericana. MAPS Chile. (2014). Opciones de Mitigación para el Cambio Climático. Fase 2: síntesis de resultados. Santiago de Chile: Ministerio del Medio Ambiente. Martínez-Salgado, C. (2012). El muestreo en investigación cualitativa. Principios básicos y algunas controversias Sampling in qualitative research. Basic principles and some controversies. Ciencia e Saúde Colectiva, 17(3), 613-619. Mascareño, A. (2011). The ethics of the financial crisis. Crisis in Constitutional Perspective. In P. Kjaer, G. Teubner, & A. Febbrajo (Eds. ), The Financial Crisis in Constitutional Perspective (pp. 333–353). Oxford: Hart. Ministerio de Energía. (2015). Energía 2050. Política Energética de Chile. Santiago de Chile. Moyano, E., Paniagua, Á. & Lafuente, R. (2009). Políticas ambientales, cambio climático y opinión pública en escenarios regionales. El caso de Andalucía. Revista internacional de Sociología, 67(3), 681-699. Nasirov, S. & Silva, C. (2014). Diversification of Chilean Energy matrix: Recent Developments and Challenges. (online): http://www.iaee.org/en/publications/newsletterdl.aspx?id=256. Nisbet, E. C., Cooper, K. E. & Ellithorpe, M. (2014). Ignorance or bias? Evaluating the ideological and informational drivers of communication gaps about climate change. Public Understanding of Science, 24(3), 285-301. Nygrén, N. A., Lyytimäki, J. & Tapio, P. (2012). A small step toward environmentally sustainable transport? The media debate over the Finnish carbon dioxide-based car tax reform. Transport Policy, 24, 159-167. Postigo, J. C., Wells, G. B. & Cancino, P. C. (2013). Social sciences at the crossroads ? Global environmental change in Latin America and the Caribbean. In ISSC/UNESCO (Ed. 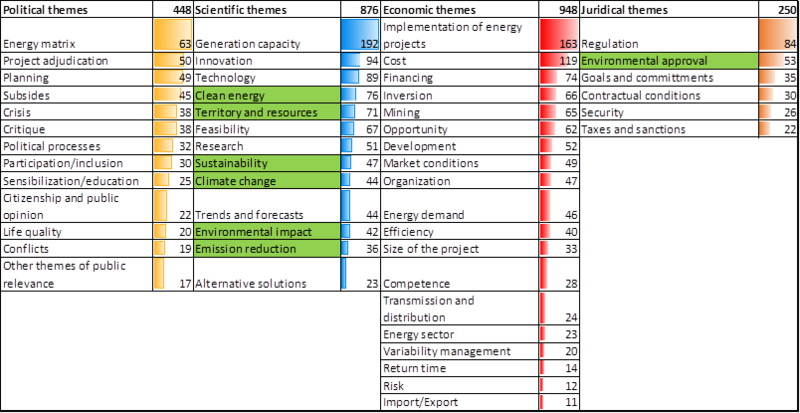 ), World Social Science Report 2013: Changing Global Environments. OECD Publishing and Unesco Publishing. Rodríguez, R., Peña, P. & Sáez, C. (2014). Crisis y cambio social en Chile (2010-2013): el lugar de los medios de los movimientos sociales y de los activistas digitales. Revista Anagramas, 12(24), 71-93. Scheer, D. & Renn, O. (2014). Public Perception of geoengineering and its consequences for public debate. Climatic change, 125(3-4), 305-318. Smith, H. M. & Lindenfeld, L. (2014). Integrating Media Studies of Climate Change into Transdisciplinary Research: Which Direction Should We Be Heading? Environmental Communication, 8(2), 179-196. Takahashi, B. (2013). La influencia de las agencias internacionales de noticias en la cobertura de los efectos y las soluciones del cambio climático: un estudio de caso del Perú. Razón y Palabra, 18(84). Villodres, M., Castro, F. & García-Leiva, P. (2014). Communicating climate change: Improving the effectiveness of public campaigns. Escritos de Psicología, 7(2), 28-35. Willke, H. (1993). Systemtheorie entwickelter Gesellschaften Dynamik und Riskanz moderner gesellschaftlicher Selbstorganisation. Weinheim, München: Juventa Verlag. Yang, Z. J., Rickard, L. N., Harrison, T. M. & Seo, M. (2014). Applying the Risk Information Seeking and Processing Model to Examine Support for Climate Change Mitigation Policy. Science Communication, 36(3), 296-324. Zhou, M. (2015). Public environmental skepticism: A cross-national and multilevel analysis. International Sociology, 30(1), 61-85. R Fernández-Reyes, JL Piñuel-Raigada, M Vicente-Mariño (2015): “Media coverage of climate change and global warming en El País, El Mundo y La Vanguardia”. Revista Latina de Comunicación Social, 70, pp. 122 to 140. Article received on 3 August 2017. Accepted on 20 October. Published on 27 October 2017.